The definition of insanity is doing the same thing and expecting a different result (or something very like that). I feel as if that defines my writing journey of late, and possibly that’s why I’m getting so frustrated. I keep sending my novels out to publishers, they hang onto them for a year, and then they send me a form letter rejection. I’m still waiting for the form letter rejections for the most recent two, but I’ve been waiting 7+ months on both of them, and I’m sure that if the publishers loved them, I would have heard about it by now. I’m not quite ready to give up totally on the traditional publication path and head down the self-publishing road (but I’m pretty close). And don’t get me wrong, it’s not snobbery about self-publishing that stops me, but rather having to teach myself the ins and outs of hiring an editor, a cover designer, marketing etc. It’s a lot of learning and I won’t do a half-hearted attempt, so I will put that off a little bit longer. Instead I’ve decided to do the next best thing; networking. I’ve just joined clubs, courses and the SA Writers centre over the last week. If I can’t make some inroads into the publishing industry by getting to know people over then next 6 months, then I’ll self-publishing by Christmas! And if nothing else, I’m sure I’ll meet some people who can teach me about editors, designers and how to market. I’m getting too old to do this waiting thing any longer. This one slipped past me because I wasn’t expecting it until 2019. It was published last Sunday, but I didn’t check my email soon enough. This story, Bleed, is quite dear to me. It has a very personal meaning and was inspired by something in my life. Anyone who has read the story will be a bit confused by that, I’m sure, because the story is set in a time and place that is clearly not our earth. It is a horror story, but only insomuch as there is a bit of gore, and bad things happen to people. It actually feels a bit more magical realism to me, but there’s not quite enough ‘real’ to truly fit into that category. I’m not going to tell you the meaning behind it because, firstly, it is a stand-alone story and the meaning is not required to enjoy the story, and secondly, because this twice got rejected, once with the comment ‘this is good, and it will get published, but unfortunately not with us’ – and I wonder if it was because I told them what inspired it, and maybe it hit a little too close to home? The third time I subbed it I left the inspiration story off and it got accepted, so I think there is a lesson in that. It’s published in Midnight Echo Issue 13 (which I was desperate to get into) which is the magazine of the Australian Horror Writers Association – of which I am a member. It includes some other great fiction, so you would do well to get yourself a copy. I hope you enjoy Bleed, and if I see you face to face, I’ll tell you the story behind it. A funny thing happened on Saturday. I was lounging about, stuffing my face with enough chocolate to make me wonder if it is possible to get diabetes in a single week of poor diet choices, and I suddenly got up, came into the study, and turned on the computer. More amazingly, I opened a writing project I last worked on in October and I started editing it. This is was a very rough first draft, so I needed to write new words and everything. Within the first sentence I felt like I’d never been away. Next thing I knew nearly two hours had disappeared and I came up for air, leaving the world in my story behind and finding myself again in the study. This is such a nice way to end the year. It gives me hope for a more productive 2019. I have my list of writing projects I want to complete, and now it seems I have found the motivation to get back to putting words on the page instead of just watching my own private movies. I hope you all have a very safe, relaxing and fun New Year. I’ll see you all back here next year! I haven’t had a lot of time to myself over the past few weeks. Even on the bus I’ve been bumping into people I know and chatting, or reading books. Today I sat alone on the couch with the TV turned off, the 90’s hits playing in the background, and I let my mind wander. It amazes me how my mind can go from one subject to another, completely unrelated subject, and somehow find a story. I generally start out by ruminating over something I’ve recently seen, read or watched and then my imagination kicks in. Imagine if this happened? Then that! Then…. Ahh, I think we have a story. Over the past few weeks I’ve been a little worried that the stories were drying up. I’d heard some other writers say that with age fewer stories come, but I think the truth is that with age more responsibilities and demands on our time come. Give yourself the time and a bit of quiet and your imagination is still there in abundance. Now if I could just start making the time to write some of these stories without upsetting family, friends, work and the rapidly dying hot water service! November is NaNoWriMo, or National Novel Writing Month, where writers all around the world try to write a 50,000+ word novel in a month. Now this idea was hatched in the northern hemisphere where the temperature is starting to drop, and everyone is heading back indoors. In Australia the opposite is true. I tend to have more ‘let’s-catch-up-before-Christmas’ catch-ups in November than I do in December. Not only that, but it is spring, so the garden seems to double in size every two weeks, including hedges that need clipping and lawns that need mowing. Hence, November is an extremely social and active time of the year for me. But I feel like doing something to join in, and given that spring has also meant a return to more regular walks, I think that instead of focussing on writing, I’ll focus on the generation of new story ideas. So I’m going to attempt NaStoIdMo or National Story Idea Month – where I challenge myself to come up with a new story idea EVERY DAY of November! I’ve done something similar before, but not every day and not for a whole month. I’m sure some of the ideas will be absolute stinkers, but from experience it will get me into a more creative frame of mind, which might just give my motivation the edge it needs to land on a ‘next project’ to which I want to commit. Worst case I’ll have a heap of story ideas that I never follow up. Best case, it might give me a whole year’s worth of projects just in time for the start of 2019, and the more southern hemisphere-friendly JanNoWriMo (January Novel Writing Month). One of the biggest challenges for non-professional writers is to manage the juggle to get enough time to write. A few years ago I was able to get a scratch draft of a novel written in 3 months while working full time, but I made big sacrifices. My social life was almost non-existent, I neglected my family much more than I should have, and I let the home maintenance (cleaning included) slide. Over the last 5 weeks I’ve been working in a full-on full-time job, and my output in terms of words written has been a big, fat, zero. While I think I’ll actually benefit from the break, as I got deeper into the job I found that my classic think-about-story time (bus rides, standing in the shower, just before I fell asleep) gradually got taken over by work-thoughts. So, while my enthusiasm to write was there (and even grew) my idea store was drained. The full-on part of the job is over now, so I hope to slide back into part-time and free up a whole chunk of brain for writing. But I know I can’t go on like this forever, and I’ll have to commit to full-time work again for a much longer period if I want to help pay all the bills. But I really hate the idea that in doing so I will be sacrificing more stories. It just makes me wonder; how many fantastic novels are we missing out on, just because their authors need to earn a living? I guess this is the problem faced by artists everywhere, and that’s why sacrifice is so caught up with creativity. I just got a new idea for a story, and I love the idea. I got the idea while reading someone else’s novel, one that I’m not enjoying. The funny thing is that my new idea bears no resemblance to the story I’m reading. I mis-read a sentence, which sparked the totally off-topic idea. This makes me wonder if the idea was always there? I truly believe story ideas are out in the ether, and occasionally a write makes a connection to one of those ideas. I hope that if the writer ignores it, then the idea goes back and waits for another author, but it wouldn’t surprise me if the idea doesn’t get recycled. Humans are a bit wasteful, so why not with ideas as well? For the past three months I’ve only had minimal creative output. I confess I did write a flash fiction story earlier this week, but the idea felt forced and concocted. You can do that with flash (though not always well). This new idea feels fresh, and alive and like it will take me to amazing places I haven’t even begun to think about if I follow it. It’s a story out of the ether. Maybe the flash fiction was a sign that the muse was coming back. Today I know it is. I want to explore this idea. I want to see what happens. I want to stop watching TV and working in the garden and all the other diversions I have been choosing lately and I want to sit down and write. Humour is such a personal thing. Sometimes I worry that my idea of what is funny is quite different to other people’s. In fact, sometimes I say stuff on Twitter that I’m pretty sure people don’t even realise is intended as a joke. They think I’m serious, as well as a bit stupid. That’s my sense of humour. This is what probably gets in the way when I try to sell my humorous stories. I guess editors don’t realise they are meant to be funny, or worse, they do realise but the story just isn’t funny (to them). Logic tells me to pull the plug on writing funny stories, but they just keep slipping out, like SBD’s you can’t hold back. I’ve just penned another, and I’ve sent it out, but I can almost picture the eye-roll as the editor reads it. I really should stop subjecting all of us to dealing with them. Having said that, I have sold a few my-version-of-funny stories, however I’ve never been complemented on any of them. Perhaps I should clear a special place in my bottom drawer for my humorous writing? Or, better yet, maybe I should try to publish them under a different name. It would have to be a silly name… silly but accidentally clever. Sounds like a project for this week. 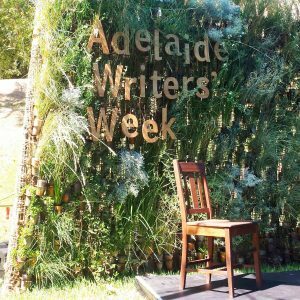 For the first time in over 10 years I did not take time off from work for Adelaide writers’ week. Yes, even when I was living in Melbourne, I used to come over for it. In fairness, I’m quite part time at the moment, so I wouldn’t have to miss many days anyway. Don’t get me wrong, it was really interesting on the days when I did go, and I still think it is a great event. Earlier in the week, when the weather was nice, it was lovely to sit on the grass and listen to writers talking about writing. Then the temperature went over 33°C which is about when my patience starts to run low, and I stopped enjoying it. I know I’m not in a particularly good place with my writing at the moment, but silly things started to annoy me; the way people took ownership of chairs and carried them around with them to wherever they wanted to go. People asked questions, which were actually just verbose statements turned into questions by saying ‘don’t you agree’ at the end, as if we were all there to hear them talk. I even had someone carry their chair and sit immediately in front of me (sitting on the ground), she then turned to look at me as if I had done something wrong? WTF? Maybe the truth is that I am not so much in a bad place with my writing, but with my fellow human beings (please BYO coffee cup). Either way, I decided to skip the last two days, which actually had the people I was most interested in listening to. Besides the forecast of 35°C days, I decided it would be better for everyone if I just stayed at home and listened to the pod casts when they come out instead. The novel’s finished… what now? Every time I’ve finished writing a novel (in recent history) I’ve always needed to keep writing over the next few days to slow down after such intense writing. Usually I throw myself into a short story or flash fiction piece. After this I’ll end up taking a break that goes for months. The post-novel short story got written on Monday, and I’m really wary of taking a break. If I do, I know I’m at risk of not writing for the next three months. I don’t want that to happen this time. So for the beginning of my ‘break’ this week, I researched writing resources: websites, blogs, videos and books. There is a lot of great and inspirational material out there if you put in the time to look for it. While I won’t necessarily learn something from all of them (though I’d be surprised if I didn’t) what I did learn was joining in with these things made me feel part of a community. In turn, this made me want to write. Now I think I’m ready to start another big project. Maybe 2018 will be the year I write two novels? Possibly more? Below is from a great channel I stumbled across called ‘Bang2Write’ and this video covers the top structure mistakes writers make. I defy you to watch it and not want to go to your computer to get started on your next project.